After Jeremy and our kids left to return home, I continued to Hyderabad, Telangana. In Hyderabad, I visited Spisys Ltd, the facility that decaffeinates our tea, and met its Managing Director Mr. J. Sobhanadri. Located on the outskirts of Hyderabad, Spisys decaffeinates tea using “Super Critical Fluid Extraction Technology” (SCFE), better known as the “Carbon Dioxide (CO2) Decaffeination” process. The carbon dioxide (CO2) decaffeination process is one of two decaffeination methods that are permitted for use with organic certified teas. The other permitted method is the “Water Decaffeination” method. At Arbor Teas, we choose to use the carbon dioxide (CO2) method to decaffeinate our teas because we feel that it is the safest form of decaffeination, while retaining the greatest flavor and health benefits. We also support the CO2 decaffeination method because the CO2 used for decaffeination can be filtered and recycled at a rate of around 99%, and emits very little CO2 into the atmosphere. Additionally, the CO2 can be captured and repurposed. For example, Spisys captures the caffeine and sells it in powder form as a caffeine additive to be incorporated into other food items such as soft drinks. When I visited Spisys, Mr. Sobhanadri was preparing to decaffeinate tea for us at Arbor Teas. He gave me a tour of the facility and explained each step of the decaffeination process. 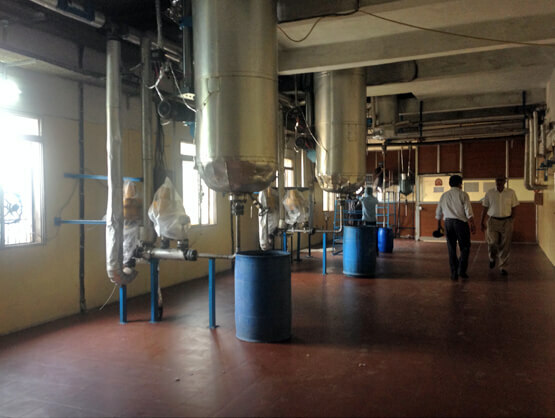 Unlike tea growing and manufacturing in India, which is an expansive process that involves many people, the decaffeination process is very contained and only requires a handful of employees. The facility consists of a labyrinth of tubes and pipes that connect various vessels throughout the two-story building. Tea grown and processed anywhere in the world can be decaffeinated at this facility, but the majority of the tea decaffeinated is grown and manufactured in India. After the tea is grown and processed into its final form (black, green, oolong or white) at the tea estate, it is transported to Spisys, where it is stored in a holding room. Because the plant only works with one product at a time (to prevent cross contamination of flavors and scents), the holding room was filled with tea when I visited, while the rest of the plant was in the process of being cleaned after an extended run using ginger. And, no, the ginger was not being decaffeinated! Originally, Spisys was not a decaffeination facility. In fact, its roots were in herbal and spice extracts, as the same Super Critical Fluid Extraction Technology is used for both decaffeination and extraction. 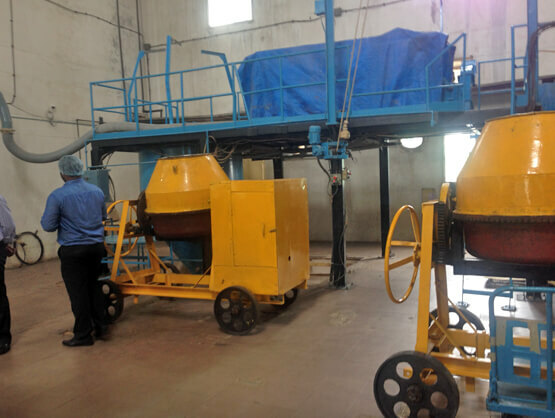 After the facility is thoroughly cleaned (which can take upwards of 3 days), the tea is moved from the holding room into a wetting room where a small amount of water is added to the tea in large barrel shaped mixers. The water is added in very precise quantities that are constantly adjusted so that the most minimal amount of water is used. The water is added to open up the tea leaf and begin to extract the caffeine from inside the tea leaf. Even though this decaffeination process is called “CO2 Decaffeination”, the carbon dioxide cannot actually remove the caffeine from inside the tea leaf. Only water can extract the caffeine from inside the leaf. Once the tea leaves are wet and allowed to rest, the tea is moved into larger cone shaped containers that hold the tea while it is bathed in a highly regulated sequence of carbon dioxide (in a super critical state) and moisture to continue the process of removing the caffeine. This step in the decaffeination process is when the true art of decaffeination takes place. Similar to tea manufacturing, decaffeinating tea is a craft that is honed over the course of many years of trial and error. To simply remove caffeine is one thing, but to remove caffeine while retaining the flavor and color of the tea leaf is very difficult. The skill of the decaffeinator is what can differentiate a flavorful cup of decaf tea from one that is not. It requires an artful monitoring of pressure gauges that have to be adjusted and re-adjusted constantly depending on moisture content, type of tea, shape of the leaf, etc. Finally, after the tea is tested and passes the required caffeine levels (or lack thereof) the tea is dried and allowed to rest for up to 48 hours. Interestingly, if the tea is packaged too soon after drying, any remaining CO2 on the tea leaf can cause effervescence in the final cup, just like carbonation! I hope you enjoyed this latest installment from our travels in India – stay tuned for another installment coming soon!